Author Mike ShuttleworthPublished on 26/11/2017 03/12/2017 2 Comments on Monte Carlo Simulation: How does it work? Following on from one of our earlier posts, where we looked at the difference between Qualitative and Quantitative Risk Analysis, this time we will look at another Quantitative Risk Analysis method, being Monte Carlo Risk Analysis, also known as Monte Carlo Simulation. Monte Carlo Simulation is a technique used to provide a better degree of certainty on the probability of outcomes in financial, project management, cost, and other forecasting models. The first step in quantifying any risk is to make certain assumptions about both the likelihood of risk event occurrence and the impacts of this risk, should it still occur. Most of the time, our assumptions will be based on either historical data, expert knowledge in the field, or past experience. At other times, it will be pure guess-work. Monte Carlo Simulation takes the guess-work out of predicting both the likelihood of risk event occurrence and the risk outcomes by randomly selecting a value within the range of uncertainty, and calculating the likelihood of this value being the correct result. It does this by repeating the calculation multiple times (hundreds of thousands to millions of times) using other randomly selected values within the uncertainty range, and comparing the results of all values. Here, each task cannot start before the preceding one is complete, so the estimated duration for completion of all three tasks is 17 weeks. 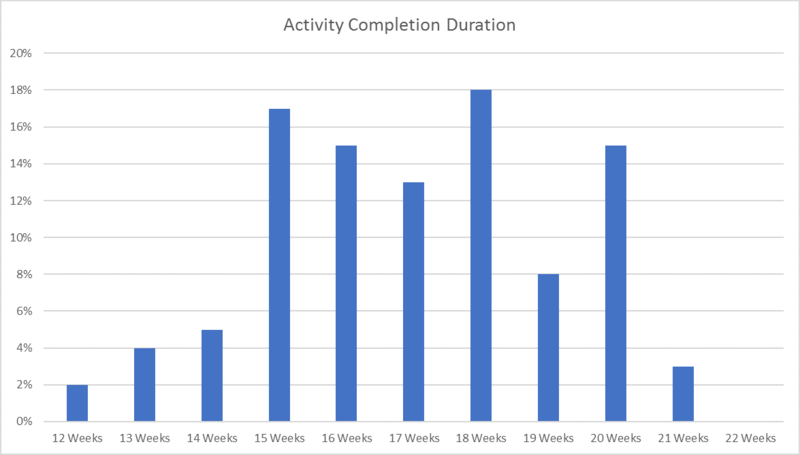 However, if we now consider a range of uncertainty in duration for completing each task, the schedule will look like this: Running a Monte Carlo simulation for each activity 100,000 times across the range of duration uncertainty, we end up with a distribution of the outcomes which shows us that the most likely duration for all three tasks to be completed is 18 weeks, and not 17 as was initially estimated. Another way of looking at this, would be to consider the cumulative probability distribution curve. This gives us an indication of the probability of completing the activity within a certain time-frame. 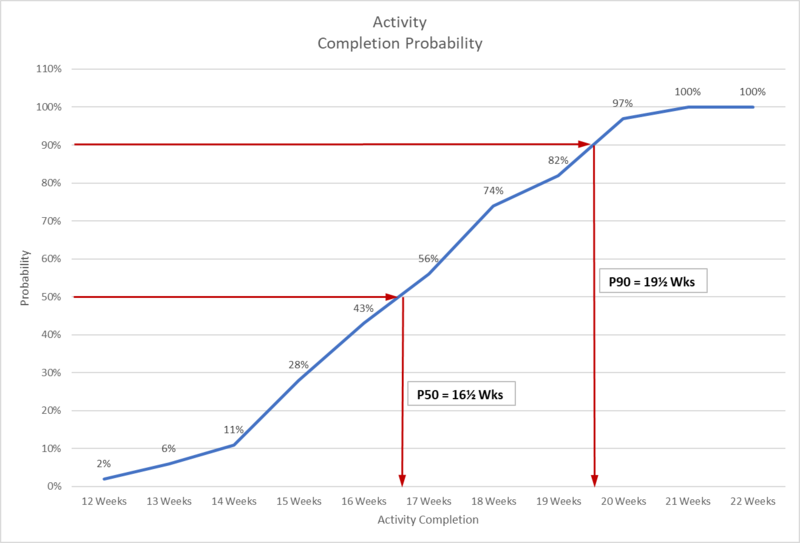 From the cumulative probability curve shown above, we can establish that there is a 50% chance of completing the activity within 17 weeks, and a 90% chance of completing the activity within 20 weeks. We can therefore use Monte Carlo simulations in situations where experience or expert knowledge is lacking to give us a statistically based value on the probability of a certain event occurring, or the probability of the outcome of that event. However, this value will only be as accurate as the information provided to run the simulation. In other words, if your range of duration estimates for each activity is either too broad or inaccurate to start with, the value of the simulation output will, likewise, not be very accurate. In our next post, as requested by one of our blog followers, we will look at the difference between Risk and Uncertainty. Previous article:Risk Prioritisation – Which risks are more important? Next article:Fast-Track Project Delivery – Can it be done without sacrificing cost or quality? I would like to know about software. Thanks for your query. If you are looking for information on Monte Carlo simulation software, there are numerous commercial applications available on the market. You can search for these by typing "monte carlo simulation software" in any of the available online search engines. If you are looking for project risk management software, you can download a free version of this from our website: http://www.project-risk-manager.com/software/. If you have a specific query about our software, please drop us an email at [email protected] and we will endeavour to answer your questions as soon as possible.